First Day of School, part 1. The first day of full time, real life, public school for the three younger kiddos this year was August 16th. I was so nervous about the logistics of getting them hither and thither, but I needn’t have worried. It was no big deal. And the kids all had a good first day, even though they thought it was soooo boring to have to listen to All The Rules! Ugh! There are definitely different challenges with public school than homeschool, but so far I wouldn’t say that either is particularly easier. While I miss my kids during the day, I am definitely finding that I’m able to get quite a lot done without them home, which is great, because once they’re home, I can really focus on being WITH them, rather than trying to multi-task work and studying with homeschooling and housework. Not to mention fitting Levi in there somewhere, poor guy! The homework level isn’t bad at all, either. None of them have more than about half an hour of work on a daily basis. I feel hopeful that this year is going to turn out to be a year of great progress for my kids! Lydia’s first day of 6th grade. She wanted to declare to everyone right up front that she is a proud geek. 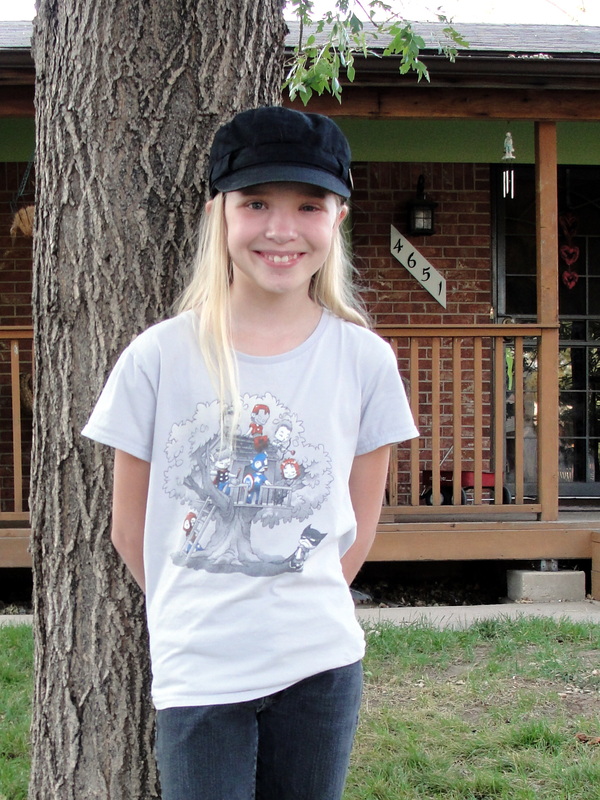 So, naturally, she chose her “Marvelous Club House” Woot shirt for her first day. I totally cried when I dropped her off. She was able to find her way to and from all her classes without any trouble on the first day, and also discovered that she doesn’t have a locker partner! We weren’t certain at first, but as the days wore on, it was confirmed. Lydia officially has at least one space in the universe that is her Very Own. We have yet to get a few decorations, but we will. 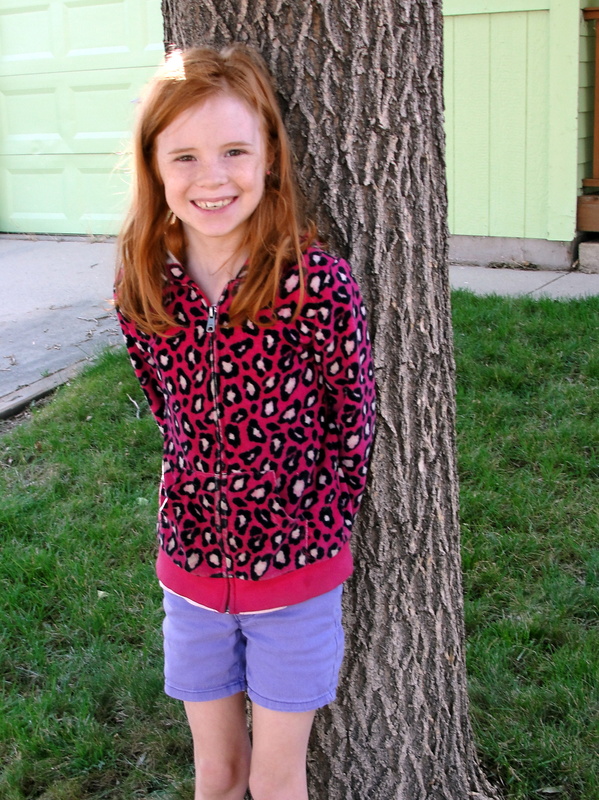 We also found out this week that Lydia has tested into advanced Literacy, Social Studies, and Science classes! She needs some help in math, but I expected that, being that it was my weakest homeschool subject, no matter how hard I tried. The good thing is that her favorite teacher is her math teacher! I call that a blessing! This is Audrey’s first day of 5th grade. FIFTH GRADE, people! She was so, so excited for her first day! Daddy took her, since it was a Tuesday, and I had an early appointment at the office. That was probably best, since I would have been a hot mess dropping them off after dropping Lydia. My little extrovert is already making friends and loving her teacher! She says her teacher is pretty strict, but she’s hilarious, so that makes it all worth it. The focus in class this year is preparing them for middle school next year, so her teacher is taking the approach of helping them shoulder the responsibility for their school work. I like this teacher already. Overall, I am optimistic about Audrey’s prospects, and I look forward to seeing her blossom a little more this year. I think the challenge and stimulation of a classroom environment will be good for her this year, and it’s so far been confirmed daily in her after school chatter. Dain. This kid is in 3rd grade, if you can believe it. Honestly, I can barely believe I got him this far, and consider teaching him to read my greatest Life Accomplishment thus far. Frankly, I have run out of ideas of how to keep him focused and motivated, and am grateful for the help his teacher is already offering to him and to me as we navigate this year. Third grade is a bit of a jump from second, and I wasn’t sure he was ready for it, even though we put him through first grade twice. This kid is uniquely bright, but difficult to motivate. He’s a lot like his daddy that way, which is encouraging to me. I have a feeling that he’ll be very self-motivated when he finds the right subject matter. He adores his teacher, and wants so badly to live up to her high expectations, and I count that a blessing! He couldn’t care less what Mom thinks! (Of course I know my influence is more powerful, so just shush. If you’re a mom, you know what I mean.) His teacher and I are on the same page, and I have a feeling she and I will be talking a LOT about this kiddo and how to push him and challenge him without discouraging him. Posted in Kiddos, Life at the Inn, Pictures, Uncategorized | Comments Off on First Day of School, part 1. So, Dain is nine now. As of August 9th. How, may I ask, does such a thing happen? The passage of time is incomprehensible to me, and it gets old quickly. This kid. What can I say about him? He is my challenge and my joy. Snuggly and little one minute, rambunctious and loud the next. I don’t understand him all the time, but I love him deeply. He is my last born, the bearer of all my “last firsts” as a mother. He often gets overlooked, to both his detriment and his benefit. The downside is that I often plan the least for his birthday, and think of him last when planning playdates and sleepovers. The upside is that I forget that his brother was doing a lot more around the house at his age, so I have to be conscious in spreading the workload a little more evenly. His freckles just melt my heart, and his eagerness to please touches my warm fuzzy feelings. I’m a bit of a sucker for him, as hard as I try not to be. And I overcompensate sometimes by being harder on him than I should. He is sweet, cuddly, hilarious, goofy, serious, devoted, friendly, and affectionate. He is challenging, mysterious, soft-spoken, clever, and distracted. I can’t wrap my brain around him, and I’m done trying to understand him. I just love him. With all my heart. Always. If anyone can show me the original source, I’d be grateful. Thanks! These days, we glorify the introvert. I get it. 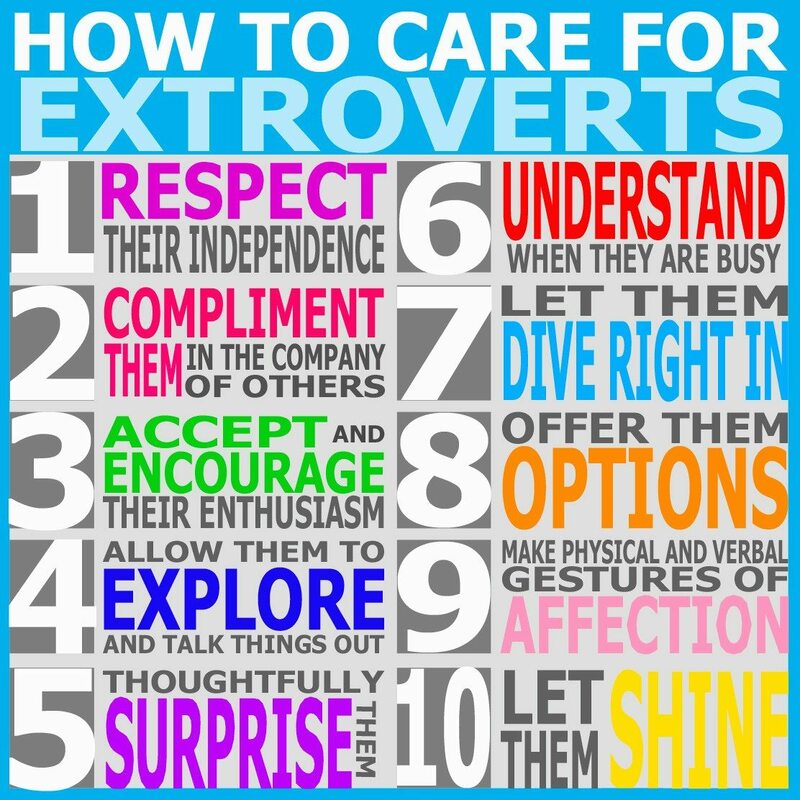 With societal pressure to be “more friendly, extroverted, and/or outgoing,” it must be exhausting to be an introvert. Believe me, I can relate more than you think I can. Because I’m an ambivert. I’m an introverted extrovert. Meaning that I lean more toward extroversion, but have strong (STRONG) introvert needs and tendencies. For example: I have the strong bonds of an introvert, with the expansive reach of an extrovert. Still, I do lean more toward the extrovert end of the spectrum. And I feel like we’ve been given a bad rap recently. Extroverts are loud-mouthed, self-centered nuisances who don’t know when they’re not wanted, right? All an extrovert needs is ATTENTION ATTENTION SPOTLIGHT ATTENTION, right? It is not shallow to desire praise. This is a recent discovery of mine. You’ve heard of the 5 Love Languages, right? Please allow me to remind you that Words of Affirmation is one of the languages. Words. Spoken out loud. In praise of another. Expressed as a need related directly to love. I have no idea how many extroverts are “Words of Affirmation” folks, but I know that I am. Though we sometimes seem to be vying for attention, it might be deeper than that. The truth is, we often aren’t fishing for a compliment, we are hungry for affirmation. There’s a difference. Never hesitate to give it. No one ever regretted words of kindness and love shared freely. You will see us light up in ways you never knew we could, illuminating your world as well as our own. Cut the extroverts some slack. 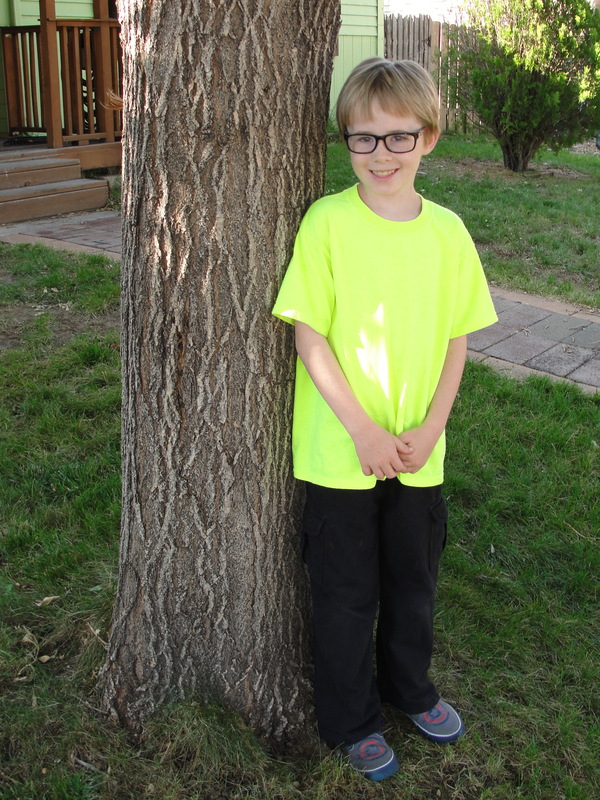 Jared is really into all things military, as he has plans to be a Navy SEAL when he grows up. He just might do it, too. So, I told him about the USAF Academy and decided to take him to check it out. It’s so much fun to see his eyes light up when he talks about the military. His head is chock full of history, trivia, and did-you-knows. We started at the visitor center, where they played a 21 minute “Year in Blue” video detailing a year in the life of Fourth Class (freshmen) cadets. The kids were all blown away. They’re amazed at the courage, integrity, and work it takes to make it at the Academy. I think it gave them a new respect for our military, and maybe planted a few seeds of desire. I would be proud to have any of my kids make it into the Academy. We then took the short hike to the USAFA Cadet Chapel – a renowned landmark. This structure is incredible. Absolutely incredible. We walked into the Protestant Chapel (the main structure), and were dumbstruck. Audrey was literally moved to tears, and when I asked her what was wrong, she replied, “Nothing, Mom. It’s just so beautiful!” I completely understood as I was on the verge of tears myself. After that, everyone was hungry, so we grabbed a snack from the gift shop, and stopped on the way back to the gate to check out Jared’s other priority, the B52 bomber. It was a hit, and Jared was excited to point out all the different parts of the plane he could recognize, and reading the placards. Posted in Uncategorized | Comments Off on USAF Academy Visit. My best is never enough. in the wake of a joy not mine. My spirit smiles, still willing. I cannot have a joy of my own. Burdens I did not purchase. for I would have to eat it all myself. Because my best is never enough. I wrote this years ago, and it has been sitting in my drafts folder. This is a struggle long behind me, but I sometimes find myself repeating the lesson. Rock the Boat: Call the Colorado state senators TODAY! Maybe you believe your vote doesn’t count in general elections. That your voice makes no difference. I won’t try to convince you otherwise. However, what DOES count is your phone calls and emails to your Senators & Representatives–in your state AND in Washington! Whether you voted for them or not, EVERY phone call represents hundreds of voters to them. I challenge you to set an example for your children, and pick up your phone. Teach them how, even if our favored politician loses the race, we can still participate and have an impact on the process of lawmaking on issues that matter to us. It took me FIVE minutes to make five quick phone calls, and another five minutes to send five emails to our state senators. Vote or don’t vote, but rock the boat! I’m seeing a lot of messages flying across Facebook asking people to contact certain members of the Colorado House Health Committee (Sue Ryden, Beth McCann, Susan Lontine and Lois Landgraf) to tell them not to Colorado Registered Midwives from attending VBAC at home. If home VBAC (vaginal birth after cesarean) with a registered midwife is made illegal, I am afraid that many VBAC mothers will choose to give birth at home without any medical assistance rather than plan a hospital birth and likely repeat cesarean. Registered midwives are trained to monitor the mother and baby for problems and transport to the hospital if complications arise. Please vote to remove this recently added amendment, and preserve the rights of Colorado home birth parents! Last, but not least, please take the time to sign this petition, right now. Just click on the heading. Posted in Uncategorized | Comments Off on Rock the Boat: Call the Colorado state senators TODAY!